Are you feeling stuck like something is holding you back from creating more money, love, or vibrant health? Are you feeling stressed or overwhelmed about next steps in your business? Are you unclear or lacking energy for your creative projects? Are you feeling a lack of joy, peacefulness and purpose? Are you feeling unmotivated and unfocused? Waking up happy, motivated, peaceful and ready to get your mission out into the world…. You want to create success and abundance in your business by accessing higher states of consciousness and intuition. You want greater clarity and intuition for inspired action in your business and in your life. You would like to breathe easier and stay in a centered place throughout your day. You want to allow the true vibrant YOU to radiate through all you do in your mission driven business and attract a greater flow of abundance. Color Healing for Vibrant Abundance is a unique vibrational energy healing modality that uses specific frequencies to affect your own personal energy field and positively affect your life. The benefits of my Color Healing for Vibrant Abundance Program are deep healing of the emotional body, to access higher states of consciousness, to feel uplifting, calming, peaceful energy, connect with your Divine Self, feel unconditional love, gain greater clarity, peacefulness, and joy. Do you want more ease and flow of abundance in your business and in your life? Do you want to create from a higher more vibrant energy? Do you want more clarity and focus as you are creating projects that support your vision and mission in life? Do you want to feel more joy and happiness? Do you want to access higher inspiration and clearer intuition? Do you want to feel confident and empowered? Divine qualities and emotions of the colors and how they can heal, support and empower you. Color Healing is a vibrational energy healing modality that uses specific frequencies to affect your own personal energy field and positively affect your life. The conscious use of color clears energetic blocks that are in the way of creating what you want in your life. 8 weeks of group calls, including time to get your questions answered. Online portal with recorded calls and modules that you can access anytime. 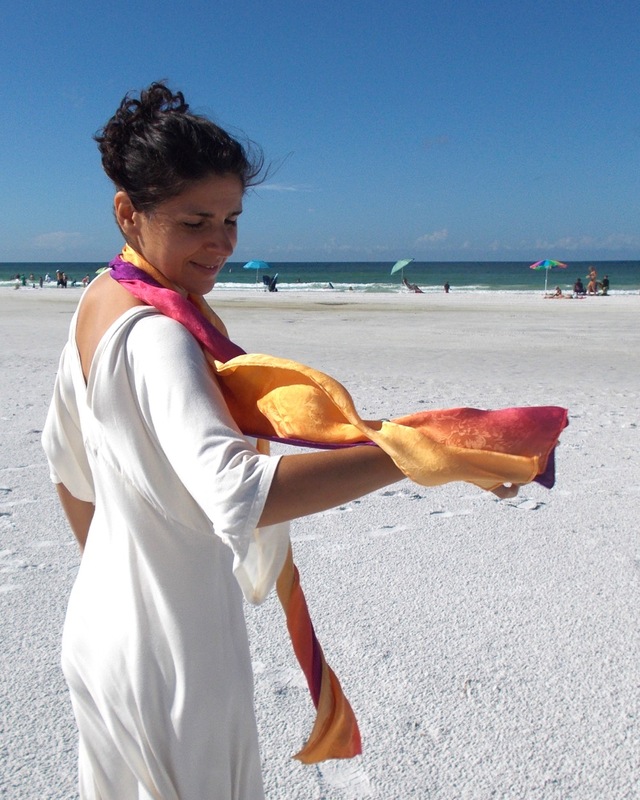 A Set of 7 Color Healing Silk Scarves- hand-dyed, energy infused. Private FB Community for sharing and support. Each week learn about Color Healing and experience the energy of a color by wearing the color healing silk scarf during.... meditation / visualizations / affirmations / everyday life, while learning about that specific color / emotions / qualities / practical ways to use color every day to raise your vibration and create success in your business and abundance in all areas of your life. 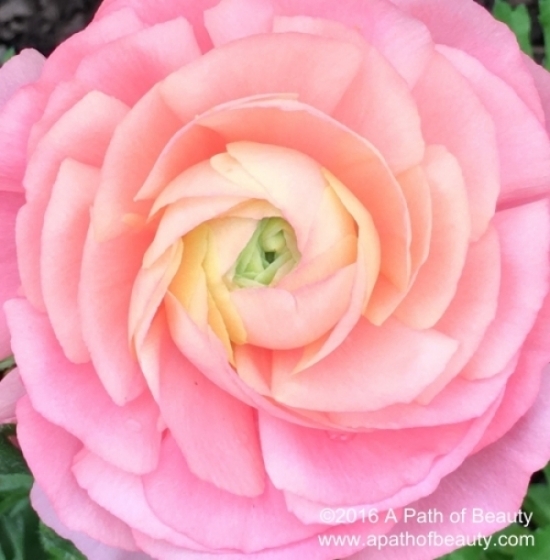 Anna Champagne is a professional fiber artist, energy healer, teacher, author, designer and entrepenuer, owner of Anna Champagne Silks and A Path of Beauty. 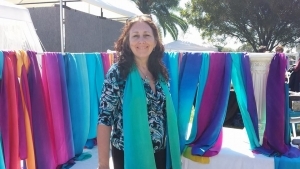 She has degrees in textiles and interior design, and has trained extensively in the holistic healing field, including emotion code, body code and transformational breathing, and created Color Healing for Vibrant Abundance System. As a Fiber Artist for over thirty years, and as Color Healer working in the holistic healing field for 2o plus years, I wear the silks daily to protect my energy, raise my vibration and support me with positive energy. 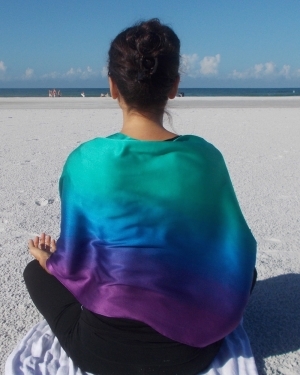 A friend who commissioned several hand painted silk shawls and blankets describes them as an energetic cocoon, making it easier to access higher states of consciousness during his meditations. I use the silks in color healing sessions. For example, I would place a soft soothing pink scarf over the hearts of my clients to help heal grief and sadness. 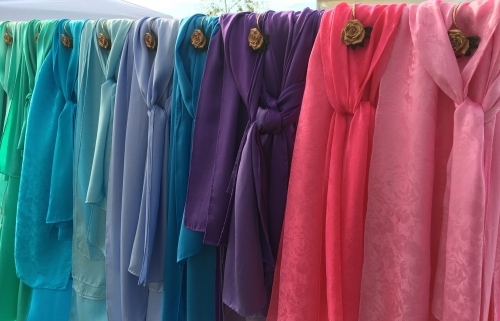 My clients have used the silks for healing and empowerment in all areas of their lives, as have I! When I had a serious injury 5 years ago, the Angels literally saved my life! My ankle was shattered, I had emotional trauma, and my business stopped in that moment. I couldn't paint silks because to do that I have to be on my feel moving. I had two surgeries and years of physical therapy. I have consciously used Angels, color and my color healing silks to assist in my healing physically and emotionally. I would wrap one of my hand dyed, energy infused, color healing silks around my ankle and foot. Even when I was in a cast I could feel the soothing energy. My surgeon said before the second surgery that he couldn’t take out some of the hardware because my bones wouldn’t be healed yet. When he went in, my bones were healed and he was able to remove the hardware! I have been using color healing to get me back on my feet with my business, gaining greater clarity and focus, step by step, calming the overwhelm, and returning me to a place of joy and peacefulness. The next course starts in May 2019, online through weekly Zoom calls. Other payment options also available on the sign up page. THANK YOU! I look forward to your Presence in my color healing course! and you will be sent the set of color healing silks by the start of the course. Want to chat to see if this is right for you? Email Anna at support@apathofbeauty.com and we'll set up a time. © A Path of Beauty. All rights reserved.